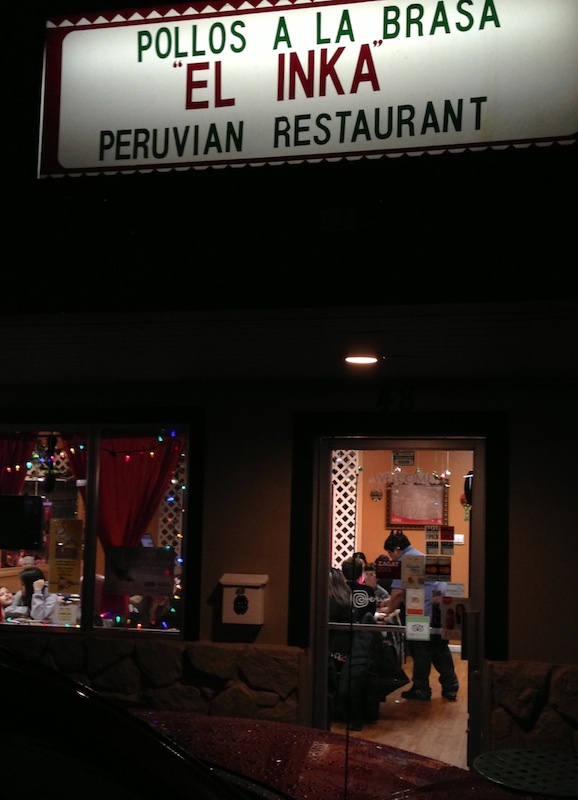 Good Stuff NW: Best Peruvian in PDX…in Gresham? It's like finding a twenty dollar bill on the sidewalk and there isn't a soul in sight to return it to. Or winning a bottle of local coffee liqueur by guessing a stranger's birth year (and yes, this actually happened to me). In other words, a smile from lady luck, a kiss from her lips on your cheek. That's how it felt when our neighbors invited us to their favorite Peruvian restaurant. One of the pair hails from Chile and knows his South American cuisine intimately, so I was excited to be going along. Though when he mentioned the place was in Gresham, I had to admit to a frisson of apprehension…great food? Gresham? Really? Just as we were leaving to caravan to our destination, we were cautioned that it was not a fancy place. This was more than confirmed when we pulled into a dumpy strip mall somewhere out in deep suburbia. But when you're in, you're in, and I kept telling myself that these two wouldn't steer us wrong. 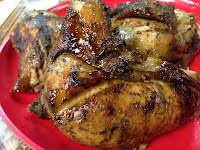 The glaring signage of El Inka trumpeted their "Pollos a la Brasa," or rotisserie chicken, roasted in a giant wood-fired oven by owner Claudia Fernandez. Our guides had wisely requested that one be held for us, since the birds have been known to sell out on a fairly regular basis. Though the small room was packed when we arrived, our table for five was ready quickly and we sat down. And this is where the one and only drawback to the place comes in—they have no alcohol available. No cocktails, no wine, not even a beer. Though I have to say that their chibcha morada, a traditional Peruvian juice made from blue corn, is quite refreshing, as is the mango drink called maracuyá. 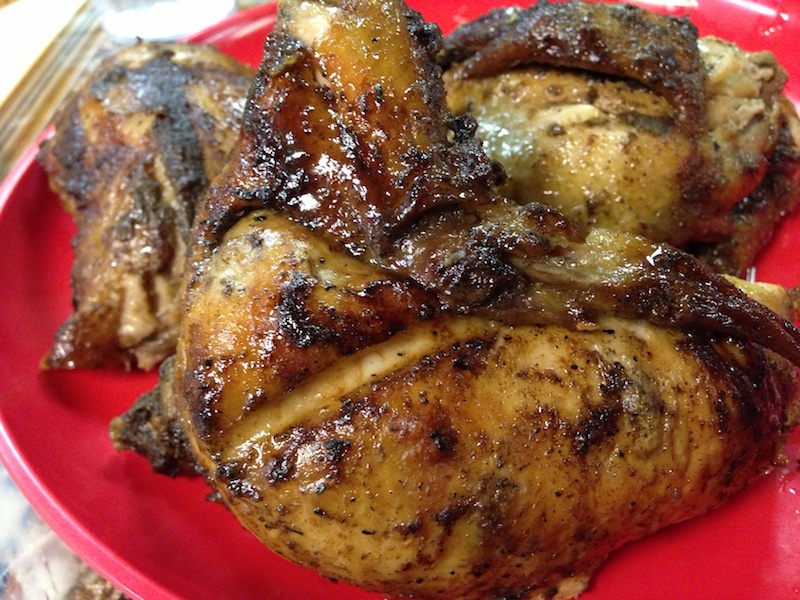 The chicken is, as advertised, a highlight of the menu, perfectly bronzed and succulent in a fall-apart tender way with a cumin and chile rub that causes even non-chicken skin lovers to fight over it. But the highlight of the meal was a starter of ceviche of mixed seafood and fish (top photo) that surpassed any ceviche I've had in Portland by several miles. Fresher-than-fresh white fish, squid, shrimp and teeny little shelled mussels were marinated in a lime-spiked bath and tossed with red onion, celery, green onions, tomatoes and cucumbers. The capper was a side of what looked something like corn nuts and turned out to be cancha, or a popped, roasted corn kernel made from Andean maiz chulpa that gave the dish a crunchy, nutty, roasty snap. 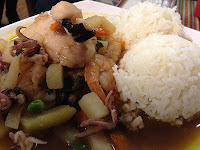 This is a dish worth traveling far out of your way for, even to a little strip mall in deep Gresham. 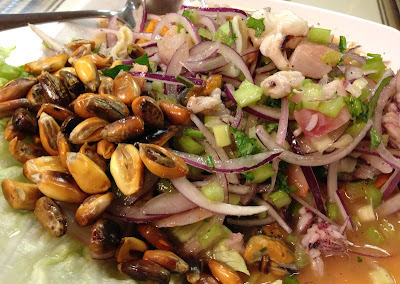 The rest of the meal was also really good, though the ceviche was a tough act to follow. We had the papa a la huancaina, steamed potatoes covered in a creamy aji amarilla sauce of yellow peppers and mayonnaise, a traditional preparation of Peru's indigenous tuber. 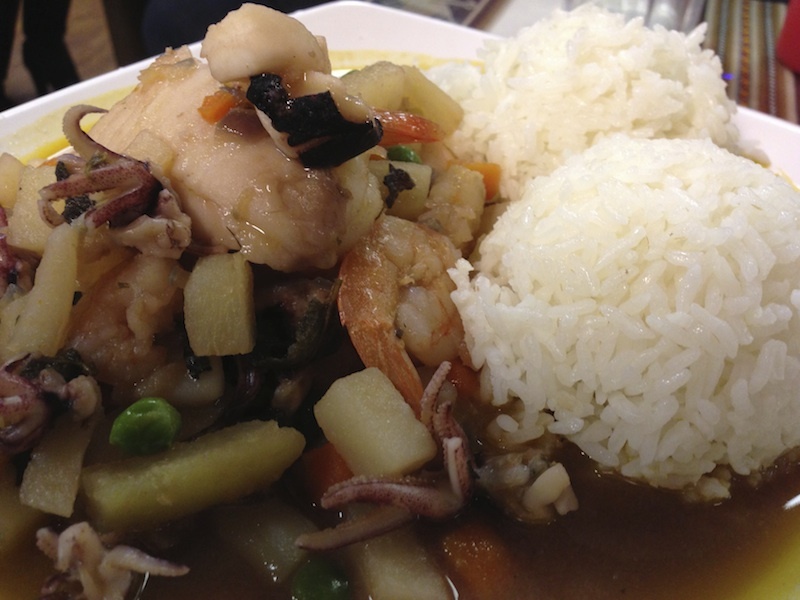 A caucau de mariscos was a fish stew with a mix of vegetables and served with rice, a mild and pleasant dish. The quinoa salad, or ensalada de quinua, was like a Greek salad with that native grain added, a nice if somewhat pedestrian break that was elevated by the addition of more cancha. Love those things! 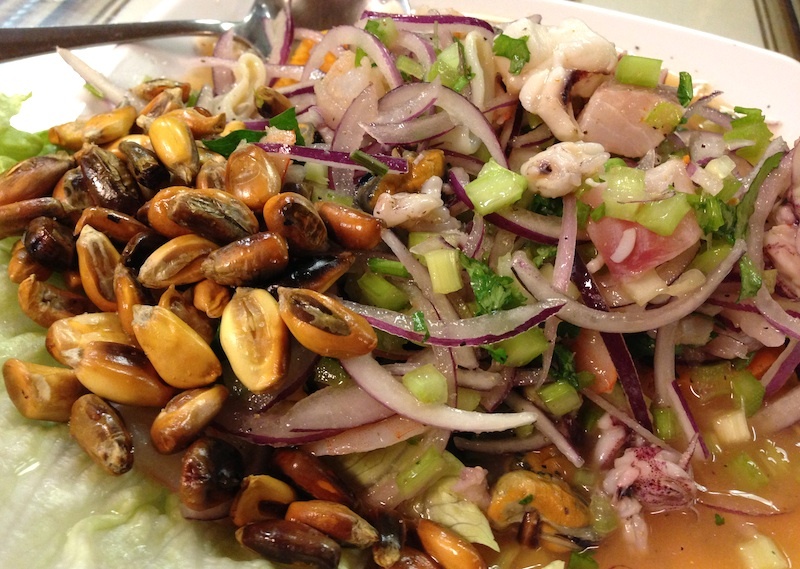 But rest assured I'll be dreaming of that ceviche until we return—soon!—to have it again. And I hear that there are a few other items we missed that are well worth ordering, so stay tuned. Details: El Inka, 48 NE Division St., Gresham. 503-491-0323.